Firstly I’ll take it you know the definitions of Risks, Constraints, Assumptions and Requirements. If not I would recommend looking them up and there is great overview in the VMware recommended study resource around CAD’s. We covered what requirements are, how you would collect them and how they needed to be concise and be mapped to the infrastructure qualities of AMPRS in objective 1.2. During the workshops and interviews you have done with the customer you will also have picked up that a number of their requirements will have been around using certain technologies or certain methods for the project. A constraint is where the customer has asked you to use a certain vendors storage for example or that you have to use their existing network infrastructure. These are almost always non-functional requirements and your biggest challenge around this is understanding how the technology they have asked for you to use will impact the solution in a holistic manner. There are always constraints in a project and it is your job as the architect to record these and understand them and then determine if these are not going to meet what the customer requires from the solution (using a 1GbE network can be a severe one on a vRA design) , is a risk to the project (the existing storage you have to use for the project is end of life in 18 months’ time and the migration to new storage is currently undefined from the vendor for example) or it actually meets the requirements of the solution and is just a constraint. Risks as I mentioned above are a fair portion from the constraints but also external risks such as the project is being done the arab emirates and there are seasonal sandstorms that affect the communications to the data centre or it can be down to personnel where the people from the customer due to maintain the project once you leave have never touched VMware technology before. I like to have a risk register where I record all of these, rate them on their severity (Low,Medium,High and Critical) and also the risk mitigation or if there is no mitigation then that the project sponsor or someone high up has accepted this risk. So to use my example of customers IT team having no VMware knowledge or experience they could mitigate the risk by sending people on the required training and that there is dedicated time allocated to them outside BAU work to work with the consultants building the solution to gain knowledge and experience as well as knowledge transfer workshops at the end of the project. Assumptions are where you can’t get a definitive answer on something that the project relies on and so you have to assume that it will be in place for the success of the project. Assumptions in real life designs should be as minimal as possible as it is your job as the architect to try get clarification on any assumptions but sometimes you have to have assumptions for example that the storage solution purchased from vendor XYZ will be built and configured in a resilient manner to a production level standard seeing as you aren’t the one doing this portion of the design. 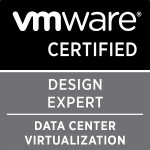 “Best practices” are a double edged sword but for the exam these are the gospel and knowing the VMware way of designing it is a must (which is what it was like in the VCAP4-DCD and VCAP5-DCD I sat) . This is fairly straight forward if you understand my points in the section above. VMware best practices are covered largely in the vRealize Automation Reference Architecture document and the vCloud Architecture Toolkit (vCAT) documents. Very much the same as above in that if you understand what assumptions, risks and constraints are then you can amp them no problem. I think they only let you choose one quality per statement so my personal rule of thumb was that if it was between a risk and a constraints I chose it as a risk. Referring back to what I said earlier where not all constraints are risks is where you can have this difference in the exam. If you disagree with anything I’ve said above then please let me know and if I agree (I’m always open to learning) then I will update the posting. Now onto objective 1.4. Categories: Automation, Certifications, VCAP, Virtualisation, VMware, vRA | Tags: CMA, VCAP6, VMware, vRA, vRealize | Permalink. VCAP6-CMA Design Objective 1.1 – Gather and Analyze Business Requirements. Due to my decision to aim for my VCDX6-CMA this year and thereby to get it submitted in time for the only VCDX-CMA defence of the year (so far) I have had to sign up for the VCAP6-CMA Design beta exam. I’ve been working on a very large-scale vRA 6.2 project for the past 14 months and so I hope this experience of designing and building it as well as my preparations via these objectives breakdown(plus my study resources) and using some of my VCDX5-DCV knowledge will help me. So I thought I would slowly post up each objective for my own benefit but also hopefully help other people looking to pass the VCAP6-CMA Design exam (beta or GA).I will be consolidating all the objectives on my blog page here. Utilize customer inventory and assessment data from the current environment to define a baseline state. This is a really strange one for a vRA design as this normally applies for a vSphere design where you are possibly migrating workloads into a new environment but I’ll take this as possibly an assessment of the current vSphere estate and if it is a fit for the customers’ requirements from vRA. This is still conceptual so basic things like sites connectivity possibilities if they want off site DR or stretched clusters. This could also mean the workloads being created on the vRA portal as catalogue items are currently workloads running somewhere and an analysis of these to determine possibly sizing metrics to have for example 1000 of a certain developer workstation in the vRA environment is a possibility. Also if the workstations all require isolation from each other for something like CD/CI then you will know you will need Level 4-8 capabilities to provide this isolation from NSX or Palo Alto for example. Analyze information from customer interviews to explicitly define customer objectives for a conceptual design. Is cost-effective through improved resource utilization with the use of cloud management software. Can host 1000 developer workloads. Increases agility through the use of automation and virtualization provided by cloud management software. Is accessible through the use of their custom XYZ-Cloud portal for the consumption of IT Services. Customer XYZ has chosen VMware vRealize™ Automation™ to provide their Infrastructure as a Service (IaaS) and Platform as a Service (PaaS). Given results of a requirements gathering survey, develop requirements for a conceptual design. Again this should be relatively straight forward for anyone as you’ve now spoken to all the applicable people and have taken down all their requirements and ensured there are no requirements conflicts. Requirements have to be very precise so that there is no misinterpretation that could cause scope creep and it forces you to ensure you know exactly what the customer requires and that they validate this as correct before you start the logical design. For example a requirement of “Customer wants high availability” is far too vague as everyone might have a different understanding of what high availability means. Your requirement should be “Customer wants 99.99% availability for the front end portal and 99.9% availability for consumer workloads outside of scheduled maintenance windows”. You would also include RPO and RTO values for these in my opinion in subsequent requirements so that SLA mapping is clear. Categorize business requirements by infrastructure quality to prepare for a logical design. So for example my previous concise requirement would fall under Availability, application of PCI/SOX/Hardening guidelines would fall under security, and ability to run the 1000 developer workloads would be performance. This is also very helpful if you are doing requirements mapping from the conceptual requirements to the logical design decisions to the physical design decisions. If you disagree with anything I’ve said above then please let me know and if I agree (I’m always open to learning) then i will update the posting. Now onto objective 1.2. Categories: Automation, Certifications, VCAP, VCDX, Virtualisation, VMware, vRA | Tags: CMA, design, VCAP6, VCDX, vRA | Permalink. 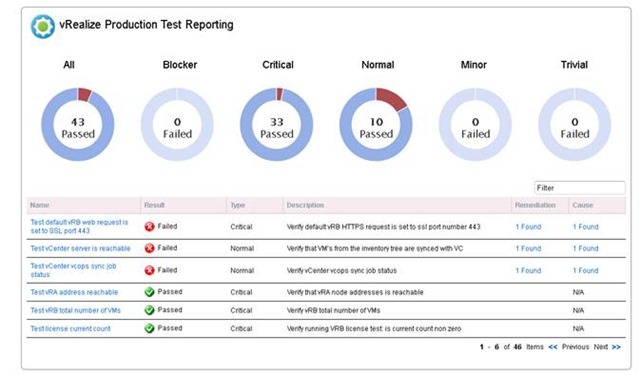 The vRealize Production Test Tool was released in April this year to allow people to do health checks on their vRealize Automation, vRealize Business and vRealize Operations solutions to ensure your environments are running as planned and the most important part to me, being able to quickly prove the environment is working to your customer/consumers. The tool is free and has been updated to version 1.2 at the time of this posting. Once once you have downloaded the tool you need to browse to the location where you saved the tool via command prompt and run the config command on the tool like the example below. 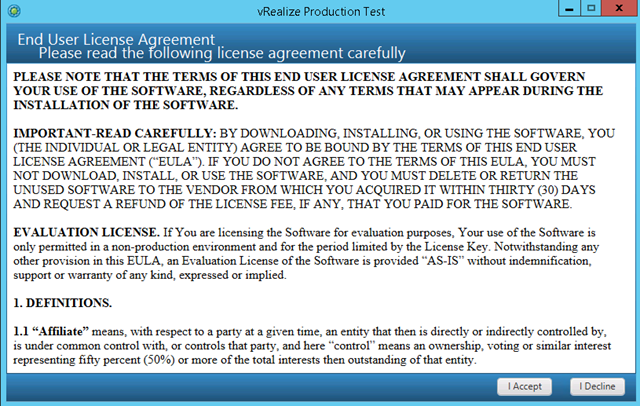 You accept the EULA after of course reading every single word and promising your first-born child and then get to the configuration UI. Click on either vRealize Automation, Operations or Business on the left hand side and start filling in all your information. 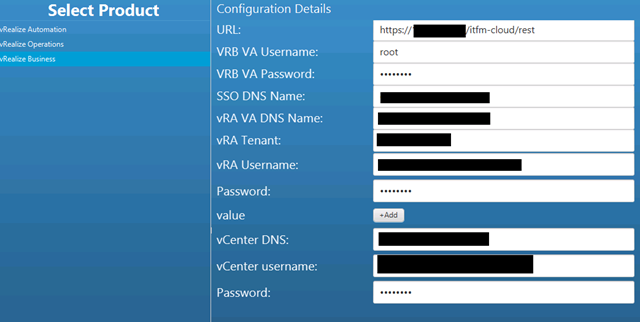 If you have selected the vRealize Automation option and have your vRA portal load balanced then ensure the vRA URL is the VIP URL of your load balancers. The rest of the information is fairly straight forward. For the endpoints I clicked the add button a few times to add additional fields so that I could enter not just my vCenter endpoints but also my vRO and NSX endpoints. 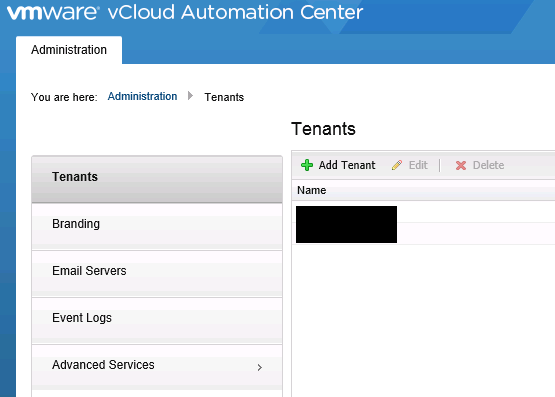 For the vRA Tenant name above go to https://your-vra-instance.com/vcac and check the name under your tenants tab and put in the exact name including the case. Now save the configuration and close the UI. 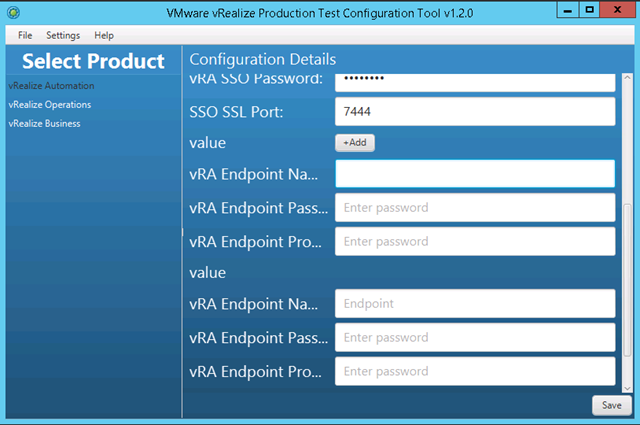 Now you can run the tool via command prompt by running the java -jar vrealize-productiontest-1.2.0.jar run –oobList VRA command like the example below. 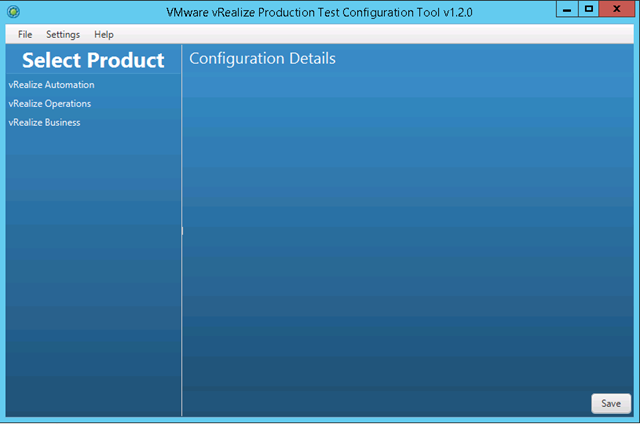 For vRealize Business click the option on the left and fill in the required information. The vRA tenant name can be retrieved via the method mentioned above in the vRA section ensuring the case sensitivity is maintained. Now you can run the test via command including the VRB acronym at the end to run the vRB test. Once it completes running it will give you the number of tests runs and most importantly how many failures you may have. You can then see the output of the report under the folder you ran the tool from /report/VRPTReport.html and it gives you a brilliant break down of the tests and where you may have had failures. The remediation and cause fields are URLs to VMware KB articles to fix the issues. In my lab I have three failures as you can see in the screenshot below. I haven’t gone through the vROPs setup but it follows very much the same method as the vRA and vRB sections. I really like the tool although it isn’t perfect for enterprise distributed installations and I had quite a few hassles with the vRA tool working but it is good and coupled with the vRA management pack for vROPs it gives brilliant reporting of your environment. Categories: Automation, Virtualisation, VMware, vRA | Tags: configuration, vRA, vRB, vRealize Production Test Tool, vROPs | Permalink.